German Thrash legends EXUMER sign to Metal Blade Records! 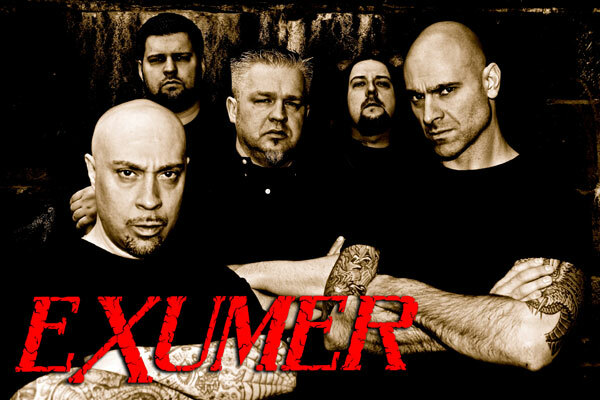 Groovey December 7, 2011 Grooveyness, Music No Comments on German Thrash legends EXUMER sign to Metal Blade Records! “Fire & Damnation” announced as title for brand new album to be released in spring 2012! The deal is done! Legendary German Thrashers EXUMER have signed a worldwide recording deal with Metal Blade Records! EXUMER just completed recording their first new album in 24 years with renowned producer Waldemar Sorychta (Grip Inc., Therion, Sodom, Moonspell, etc.) at the helm. The 10-track strong, hard-hitting CD Fire & Damnation combines a punishing production with aggressive song writing. EXUMER manages to capture the intensity and feel of the 1980s thrash metal gems and yet sound up to date on their latest output. Fire & Damnation will catapult EXUMER back in the forefront of the international music markets and the following live assaults in 2012; will only further cement the band’s cult status among the ranks of classic thrash metal acts in the world! Formed in 1985, by singer/bassist Mem V. Stein and guitarist Ray Mensh, EXUMER went on to release two albums in 1986 (Possessed by Fire), and 1987 (Rising from the Sea), that are regarded as some of the most cult thrash metal releases ever to come out of Germany. EXUMER was also one of the first thrash metal acts to capture exotic, foreign markets likePoland and Brazil, where their albums were domestically released in the 1980s. The subsequent tours that followed those releases secured the band live shows in front of thousands of fans and an unusually large following outside of Germany. Plagued by line-up changes and internal turmoil the band broke up in 1990, and did not perform live, with the exception in 2001 at the prestigious Wacken Open Air Festival, until 2009. Mem and Ray decided to re-activate EXUMER in 2008, and the band embarked on their first tour since 1988, where they played 5 shows in April/May of 2009. The “5 Nights of Fire Tour”, took the band through Europe (Germany, Holland, Greece), and the USA, where they headlined the “Thrasho de Mayo Festival”, in front of 1300 fans in Los Angeles. EXUMER returned to Europe in spring and the fall of 2010, where the band appeared at Norway’s “Inferno Festival”, among other stops in Italy, Germany, Switzerland, Poland and Bulgaria during their “European Ignition Tour Part I & II”. Watch out for Fire & Damnation to be released in the spring of 2012, and the subsequent live assaults to follow!